Hi, my name is Jolene Knight and I would love to help you finish your quilts. Longarm quilting is my specialty! I have a fast turnaround time and hundreds of all over patterns to choose from or have me do some free motion quilting for a unique finish using my Gammill & Statler Stitcher longarm quilting machine. I will notify you as soon as it’s completed. Contact me at (503) 310-8832 or send your quilt top, quilt backing and I will supply the batting for a reasonable price. A little more about me; I worked as a graphic designer from 1996 in Denver, CO, then moved to Portland, OR in 2001 where I worked at Wieden+Kennedy Advertising until 2006. I made my first baby quilt in hopes of becoming a mother in 1999. I started free motion quilting in 2008 when my sister, Jo Ann bought a Grand Quilter with a large frame. 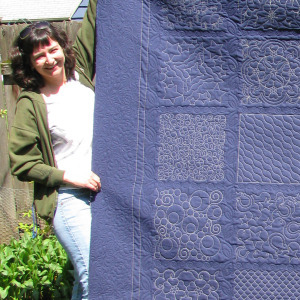 I loved being able to finish quilts and when I joined the Portland Modern Quilt Guild in 2010 and met Nancy Stovall, I knew what I wanted to do. Nancy showed me the way and I bought my Gammill and started Good Knight Quilts in July of 2012.